The late Lyndon "Don" Pallot, founder of the Museum, spent his early days as a trainee engineer with the old Jersey Railway. Later on, working as an agricultural and contracting engineer, he began collecting what he could of our mechanical and farming heritage. There is no doubt that but for this steady interest, maintained over many years, much that is on view today would have been lost forever. On Thursdays, (Tuesdays and Thursdays from mid June to mid September) the clock is turned back and you may travel in the two Victorian coaches drawn by steam from the platform of the Victorian style station. 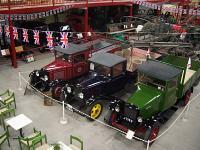 The Museum lies between the A8 and the A9 main roads (bus route 5 is the easiest) and is signposted off both. Once off the main road, other signs direct you to the Museum (also look for aerial masts) where there is plenty of free parking, toilets, facilities for babies and for the disabled.